Regardless of the size of your collection agency (or your Collections law firm), having a website is really important, it is your self-introduction to the online world. It is rather embarrassing for anyone to say “Sorry, we do not have our company website yet“. Your website will help you in getting business too if it appears in Google Search results. We are assuming you are a small/medium sized collections agency and are not interested in hiring an expensive IT guy or willing to pay thousands of dollars to outsource it to an IT company. Your website should be built using the latest technology. It should be “Search Engine Optimized (SEO)” and simple. We often come across very complex collection agency websites, which have flashy images and self-achievements revolving all around, but important pages like “Contact Us” or “About Us” are hard to find. A clean, simple and professional looking website suits everyone. Additionally, it should have a section for your debtors as well, instructing them which number to call if needed. You may place a link on your homepage, “If got a Letter/Call from us – Click Here” or “Click here to make a Payment“. You can actually get your fairly good starter website up and running for under $500. We mean expenses for the entire 1st year, well under $500. 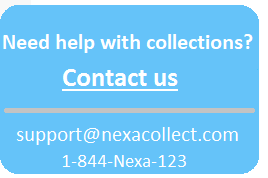 Visit the sites of other collection agencies. Do not even try to mimic or copy contents from their site, but just get ideas. Make up your mind on what you want to present on your own site. Please make sure that information in this document is finalized before giving it to a website developer, because making revisions to your website later can be costly. 3) Go to Godaddy.com (or your prefer host). 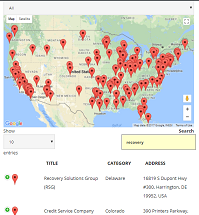 We are really not endorsing GoDaddy here, but this is the only domain registrar / hosting service we have personally ever worked with in the last 10 years and have never felt the need to migrate elsewhere. You can checkout other services like NamesCheap, BlueHost, inMotion, HostGator, etc. You can sometimes get additional discounts before the final checkout by using a Coupon code, Google the term “GoDaddy Coupons”. (a) Buy a .com domain (not the .net or .org). A deluxe hosting (https://www.godaddy.com/hosting/web-hosting) that costs about $11 a month is usually more than sufficient for a starter website. It usually costs half, if you buy for 1 full year ($5 per month). You can even go for cheaper hosting, but I feel lowest plans can sometimes make your website slow. (c) Create your email address (ex: support@xyzcollect.com) , no need to buy any extra services, one email address comes for free with domain and hosting. You can always forward incoming emails to your gmail account if needed. More email addresses will cost you extra. Means, $0 per month for an email account. (d) Create 2 FTP accounts. One for yourself and another for your “Website Developer“. This will be used to upload web pages to your website. If you have any questions, call Godaddy’s helpline, preferably during off business hours else the wait time can be longer. We have seen very early mornings or late evenings are a good time to call them. Call as many times as needed, they are pretty fine with that. Never share your Godaddy username and password with anyone else. Note: Like all hosts, Godaddy too will also try to sell you many additional products (.net. .org, website creator, SSL etc. ) decline all those, just stick to the basic products only. FTP accounts cost nothing ($0 per month). Next go to this site Fiverr.com. Search for the term “create website“. You will easily find many online “Website Developers” for under $200 (one time cost). Tell them you need a simple 5 page professionally looking site (using these technology criteria’s “HTML 5, Responsive and SEO Optimized”). Once you finalize the provider, give them your “Requirements.docx” and the FTP credentials of “Website Developer” account you had created above. Once your website is complete, go to your Godaddy account and delete this “Website Developer” FTP account. You do not want anyone to have access to your hosting account after the development is over. All this is not that hard. We feel your website should be up and running in about 1 week’s time. You would likely have to spend about 20 hours of your own time (or your employee’s time) to prepare content and other misc. work. If this sounds a bit overwhelming, take help of a friend who is slightly familiar with websites. If you are still uncomfortable and would like someone else to do all this, you will likely spend around $2000 instead of $500. This was only about putting together a basic introduction website, up and running. This does not include the SEO efforts which help in boosting your Google Search rankings, those can be quite expensive.